I got my screen repaired by Apple, and my phone bricked the next day. I visited the Apple store four times in a week, and each time was chaotic and disorganized. While rushing up the subway steps one evening, phone in hand, I tripped. My iPhone 6s broke my fall and I, in turn, broke my iPhone. Miraculously, the phone itself was fine. The insides still worked, but the screen was hideously cracked. Jagged scars ran upward from the bottom right corner, and the bottom bezel on the right side was shattered. Still, it was functional, and spending 150 on a screen repair at Apple didn't exactly appeal to me. But then I dropped my phone again. One of the glass shards popped out, leaving a gaping hole that revealed the guts of my device. It was time to admit defeat and get it repaired especially since I was about to leave town to cover the annual Consumer Electronics Show in Las Vegas. So on a Sunday afternoon, I headed over to the Apple store in hopes they could squeeze me in for a screen repair. What ensued was a week-long headache that proved how inefficient, complicated, and time-consuming Apple's retail experience can be. Upon arriving at Apple's new store in downtown Brooklyn, I was impressed by its stunning facade. With its high, sloping ceiling and floor-to-ceiling windows, the store itself is a masterpiece architecturally, at least. When I stepped inside, I was immediately struck by how many employees were working on an average Sunday afternoon. The store was packed with people, and about half of them were employees. Somehow, they all seemed busy. There was no clear place to stand or person to approach, and I wandered aimlessly before finding an available store employee. He passed me along to someone else, who in turn handed me off to a third person. The fourth employee I talked to was my technician, who took my phone and promised to repair the screen in about two hours. There were no Genius Bar appointments in Apple's online system for at least two days, so I considered this a stroke of luck. For the next four and a half hours, I went grocery shopping, went home to pack, did laundry, and watched an entire NFL playoff game still no word from Apple. Finally, I got an email saying it was ready for pickup. I returned to the store and was once again handed among three different employees, then told to go stand near a table that displayed Apple Watches. This, I was told, doubled as the repair pickup station, although there was no way to know that by looking at it. 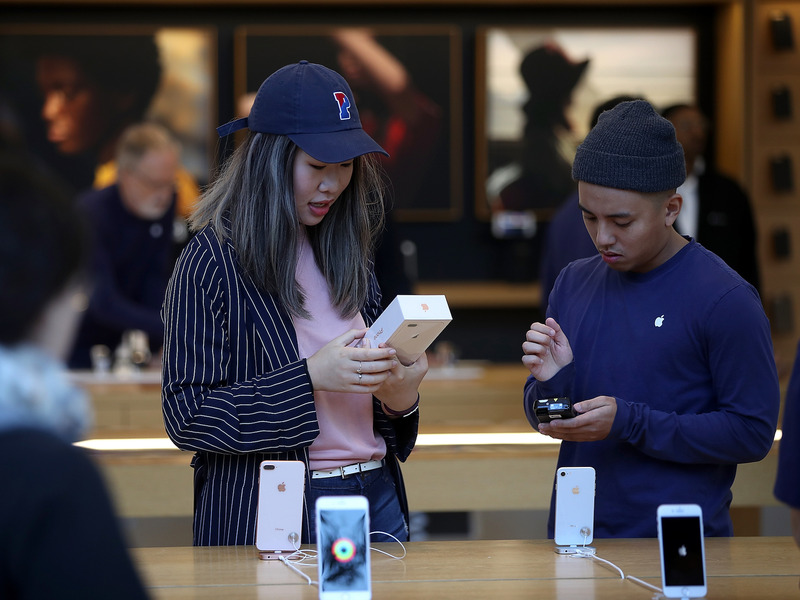 Employees moved frenetically from the table to the back room, then back again, shouting out customers' names and waving around their newly-repaired devices. I stood around waiting for my phone to come out, trying to find a spot to stand that was out of the way of all the chaos. There was seemingly no rhyme or reason to the way things worked, and despite all the employees working the ratio was about one employee to every customer everyone seemed harried and stressed out. Finally, after about 20 minutes of waiting and 150-plus-tax later, I had my phone back, complete with a beautiful new display. I thought I was in the clear. Everything seemed fine until I landed in Las Vegas the next afternoon. My phone had been working normally the previous evening, and I hadn't had any issues that morning. But in the process of sending a text, my screen went black. The Apple logo flashed once, then it went black again. I won't bore you with the details my phone was bricked. I tried doing everything you're supposed to try a hard restart, plugging it into iTunes, attempting a factory reset and nothing worked. But I was in Las Vegas about to embark on a week at the biggest tech show of the year. There was no time to go back to the Apple Store. Luckily, I had brought along a Google Pixel 2 review unit to try out the camera at CES, so I swapped in my SIM card and hoped I didn't miss too many iMessages. Upon my return to New York a week later, I went back to a different Apple store for visit number two. Unfortunately, it was another disorganized mess. I walked into the lower level of Apple's World Trade Center store and waited several minutes to chat with an employee. But that conversation ended up feeling like a game of "Clue." This meant walking around the entire upstairs and peering at each employee's iPad until I found one with a red cover. I then had to make another appointment to return in about 30 minutes. Upon returning, I was told to find the person with a red iPad again a different employee this time! who told me to go sit at a table and wait. So I did. Someone came by my table to get more information he still wasn't my technician and finally, 20 minutes after arriving for the second time, the technician I needed came over to look at my phone. But after all that, he tried all the things I had already tried, then gave up, and handed me a new iPhone. There are two silver linings to this saga: One is that I had a backup phone with me in my time of need, and that phone worked fabulously. I can't say enough about the Google Pixel 2's camera, and the phone is dead-simple to set up and use. I would recommend the Pixel 2 to anyone, and the only reason I'm not switching to that phone entirely is because I still haven't paid off my iPhone 6s. The other silver lining is that I now have a new iPhone 6s. My second visit resulted in them handing me an Apple-refurbished device at no extra cost, since you automatically get a three-month warranty from Apple when you get your phone repaired by an Apple technician. But the overall problems with Apple's retail experience were too clear to ignore. The lack of signage indicating where to stand and who to talk to is extraordinarily frustrating. Having no clear points of contact or direction is confusing for all types of customers, even someone who knows exactly what she needs and how to ask for it. I know that Apple envisions having a store where customers can flow in and out, or congregate like a "town square," but sometimes, it's just easier to stand in a line. At least from a customer's standpoint, you know where you need to be. And while doing away with traditional cash registers seems like a great retail innovation on its face, it doesn't work in a busy store. There's no clear destination to head towards, and no refuge if you're confused. In traditional stores, there's at least one person behind a register who can devote his or her sole attention to you and help you solve your problem. This brings me to the biggest issue I had: In Apple's world, every employee seems charged with helping every customer and every other fellow employee at once. Nearly every time I spoke with an employee during my week-long Apple odyssey, they interrupted me to talk to someone else, or were interrupted by a customer or fellow employee. The result made me feel like no one was listening to me or taking my concerns seriously and the shoddy repair job from my first visit didn't instill me with any more confidence. In the end, I paid 150 for a brand-new screen I was able to enjoy for less than 24 hours, and I never got that money back. Since my phone worked perfectly before I went in for a repair I had even tested my battery the week before to check that my phone wasn't being throttled, and it was just fine I can only assume that some kind of mistake was made in the repair process.